Stuart Robinson: "2017 vintage looking very good"
2017 vintage at Foggy Hill was as close to the script for a perfect vintage as Mother Nature will allow. A record wet winter had the soils at the beginning of spring brimming and cold. This delayed bud burst by 2 to 3 weeks, a delay which was maintained throughout the phonological (growth) cycle to the exceptionally late harvest on the 31st of March and the 8th of April. The flowering and fruit set processes in December were too perfect and the estimated crop level far exceeded our target for optimum quality. At veraison in mid February we cut off half of the crop. The average temperature at Foggy Hill for February is 18.6ºC, for March is 17.1ºC and for April is 14.7ºC. The temperature decline from summer to autumn is steep. The quality advantage of the delayed ripening is that the temperature sensitive physiological processes in the berry that result in aroma, flavour, tannin and colour are optimized at the lower temperatures of mid autumn. Despite the cool and wet start, the 2017 vintage finished with a warm and dry flourish that carried the season’s accumulated heat to 1400ºC days, beyond the average of 1210ºC days. The formula of a cool, wet, delayed season start followed by a warm, dry autumn is the ideal for Pinot Noir quality. The crop level at harvest was also ideal at 6 tonnes/hectare. The 2 younger blocks of Dijon clones 115 and 777, planted in 2006, were harvested on the 31st of March and the 3 older blocks of Dijon clones 114, 115 and 777, planted in 2003, were harvested on the 8th of April. 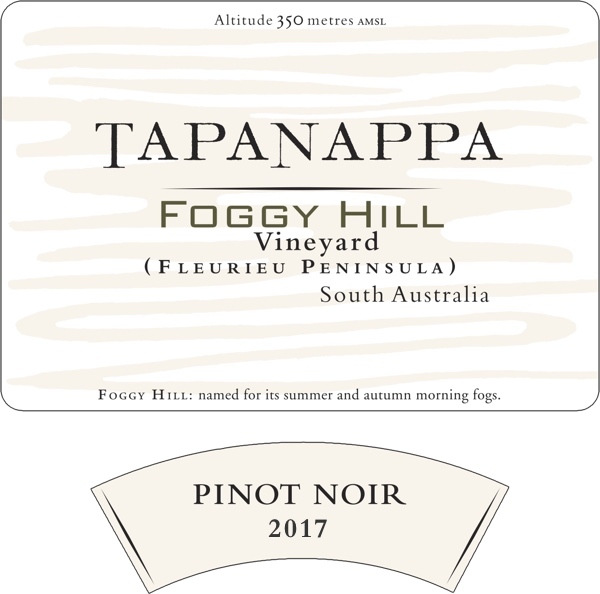 30% of each of the 5 clonal Pinot Noir blocks at Foggy Hill was hand harvested in shallow trays and chilled overnight to 2ºC in a cold room at the Tapanappa winery. The balance of each block was hand harvested the next day. The 30% of chilled whole bunches were distributed in the bottom of each of the 0.9 tonne fermentation tubs and the balance of unchilled grapes were destemmed, partially roller crushed, and chilled to 2ºC, onto the top of the whole bunches. The fermentation tubs were sealed down for a 4-day cold maceration. The fruit composition was naturally perfect. After 4 days our own selected yeast and malo-lactic bacteria strains were added to each fermenter to start fermentation. Each tub was hand plunged everyday of the 12-day fermentation, the temperature reaching 33ºC at the peak of fermentation. The whole bunches were progressively crushed during the plunging process to release all of their sugar. When the fermentation had exhausted all of the sugar the tubs were sealed down again for a 5-day post-fermentation maceration on skins. The whole process in fermentation tub takes 21 days. The fermentation tubs were tipped into the air bag press and gently drained and pressed straight to French oak barriques, 30% new. The wine went through the malo-lactic fermentation on full lees over the next two months at the end of vintage. In January 2018, the 2017 Foggy Hill Pinot Noir was clear racked from barrique and bottled in February 2018. 2017 Foggy Hill Pinot Noir is an “exquisite expression of this unique very cool maritime terroir”. The colour has a lovely intense purple hue. The aromatics are delicate and floral with spice but the profound underlying terroir expression is of complex ripe strawberry puree and a hint of earth. It has moderate alcohol and finely textured structure. The flavours float on water not alcohol. The best expression of Foggy Hill terroir yet. Bottled in February 2018. Only 1,200 cases grown and made.